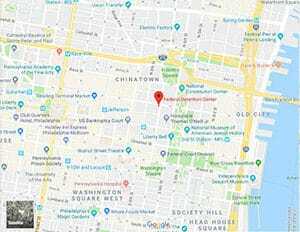 Location: FDC Philadelphia is located in the heart of the city of Philadelphia. Background: FDC Philadelphia was opened in 2000. It holds male and female inmates prior to or during court proceedings, as well as inmates serving brief sentences. The jail is 12 stories tall. It has 628 cells for United States Marshal Service pre-trial inmates, primarily from the following districts: Eastern District of Pennsylvania, Southern and Northern Districts of New Jersey, and the District of Delaware. FDC Philadelphia is also a United States Parole Commission Revocation Site. There are 120 prisoners, already sentenced, that serve as orderlies. The prison is connected to a tunnel that allows people to travel to and from the James A. Byrne United States Courthouse. Housing: Inmates are housed in either two or three-person cells or dormitories. Health Services: Health services at FDC Philadelphia include prenatal care, mental health assessments, eyeglasses, medical and dental sick call, and chronic care. Medical appointments are requested by submitting a sick call request form to the Health Services Unit for a fee of $2.00 per visit. Inmates without funds will still receive medical care by submitting a sick call request. Emergency medical care is available 24 hours a day. Psychology Services: Psychology services include intake screening, group and individual treatment and counseling, mental health assessments, and crisis intervention. Inmates are screened upon arrival and referred to a psychologist, psychiatrist, or mental health specialist for follow-up evaluation and intervention as needed. Residential Drug Abuse Program (RDAP): FDC Philadelphia does not house a Residential Drug Abuse Program (RDAP). A Drug Education Class and the Non-Residential Drug Abuse Program (NR-DAP) is available. Education Services: FDC Philadelphia provides GED, English-as-a-Second Language (ESL) programs, and Adult Continuing Education (ACE) courses. A parenting program, and re-entry programs such as MoneySmart, Mock Job Fair, Resource Fairs, employment workshops, HIV seminars, Celebrate Recovery support program, financial planning, living on a budget, and other programs are also available. High school diplomas and post-secondary programs are available through paid correspondence programs. Advanced Occupational Education: FDC Philadelphia does not offer any advanced occupational education programs. Vocational Training: FDC Philadelphia does not offer any vocational training programs. Apprenticeship: FDC Philadelphia does not offer any apprenticeship programs. Library Services: FDC Philadelphia offers both a leisure and law library to inmates. The leisure library offers magazines, newspapers, fiction, nonfiction, and reference books. Inmates are provided access to legal materials and an opportunity to prepare legal documents through the use of the TRULINCS Electronic Law Library. A copying machine is available to reproduce materials needed for research. Electric typewriters are also available for inmate use. UNICOR: FDC Philadelphia does not house a UNICOR facility. Commissary: Inmates are allowed to spend $360.00 monthly in the commissary on their assigned shopping days. Clothing, candies, food, drink mixes, and other items are available for purchase. Spending limits on certain items may apply. Recreation Services: Recreation Services available at FDC Philadelphia include both physical and leisure activities. Physical activities include basketball, mini soccer, handball, volleyball, and aerobic and yoga classes. Body fat analysis, fitness assessments, walking programs, health and wellness classes, and nutrition classes are also available. Leisure activities consist of board games, dominoes, card games, bingo, and music programming. The hobbycraft program includes drawing, calligraphy, watercolors, and crochet/knitting.